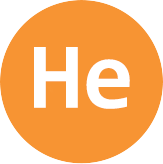 Need compressed, liquid and various mixtures of helium (He)? The Healthcare industry uses helium to provide the superconducting magnets in MRIs and NMRs with the cryogenic temperatures needed to capture high-resolution images. The Welding and Metal Fabrication industries take advantage of the inert properties of helium at arc temperatures when welding materials with high heat conductivity (e.g., aluminum, stainless steel, copper and magnesium alloys). Look for He in Labs and Life Science industries as an important carrier gas when performing complex and precise analysis. Please see the table below for information and to access safety data sheets on helium available from WestAir. Divers also create a breathing gas mixtures by combining helium with oxygen. Helium is also a safe choice for the Entertainment applications to inflate balloons. We deliver gaseous, compressed and liquid helium in a variety of cylinders, vessels and containers to fit your precise application needs.